Easy one-hand folding. New 6" casters with soft grip tires are ideal for indoor and outdoor use. 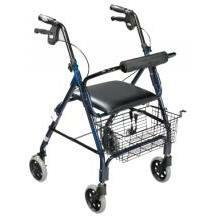 Comes with universal basket that can be mounted under seat or in front of rollator. Features include a padded seat, adjustable-height handles, and a special lever lock that protects a person's fingers from "snapback" contact when releasing the brake. Manufactured with wrap-around welds providing additional strength and support. 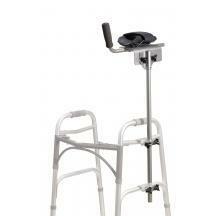 Converts heavy duty walker into wheeled walker. 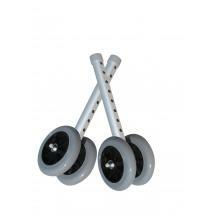 Dual, rubber wheels allows walker to glide easily and smoothly over irregular surfaces. 1/cs Folds easily with one hand. 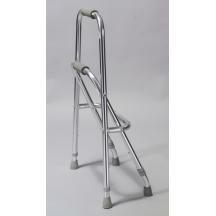 Ideal for users who do not require a walker but need a wider base for support. Lighter than a walker and more stable than a cane. Height adjustment 32" - 35". Designed for individuals with the use of only one hand or arm. *Width (Inside Hand Grip) 18.5"
*Width (Inside Back Legs) 21.5"
*Depth (Opened at Base) 24"
*Seat Height (Highest Setting) 23.5"
*Seat Height (Lowest Setting) 19.5"
*Handle Height (Highest Setting) 40"
Manufacturer: Drive Medical Design & Mfg. Includes rear glide caps, (item #10107) and glide covers (item #10107C)* allowing use on all surfaces. Especially designed for people with the use of only one hand. Folds for compact storage. Adjusts 30" - 34". Weight capacity: 300 lbs. Product weight 3(1/4) lbs. Duro-Med’s extensive line of lightweight aluminum rollators folds easily for storage and travel and help make staying active possible at any age. The ability to stay connected with family and friends can be vital for good physical and mental health. For many users, rollators have become the next generation of traditional walkers, allowing them more freedom with the added convenience of a large flip-up cushioned seat, curved padded backrest, basket for storage and hand brakes for security and stability. Features adjustable handle height for maximum comfort. Ergonomic handgrips with bicycle-style loop-lock brakes keep the rollator from unwanted movement. 8” wheels travel effortlessly over most terrain. Basket size: 16" x 8" x 5". Handle height: 32" - 36"; width between handles: 18". Seat size: 14" x 13"; seat height: 22". The next level in mobility is the new neXus III. The neXus III comes complete with a large mesh basket and deluxe contoured, cushioned seat that offers an ideal resting spot during your active day. Adjustable strap securely holds arm in place. Cradles forearm with soft vinyl padding for comfortable weight bearing. 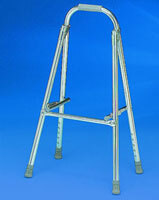 Large top bracket allows the platform attachment to be placed over the hand grip of the walker. 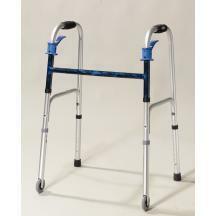 Designed for those who are unable to grip the walker. For users 5' 4" to 6' 3"
Designed for use on the rear of a wheeled walker. 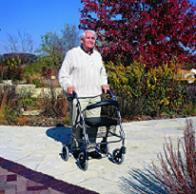 Help increase maneuverability of the walker by allowing rear legs to glide while pushing. Available in two sizes.